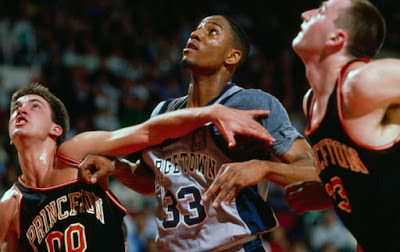 My favorite college basketball game is the 1989 NCAA Tournament first round tilt when 16th seeded Ivy League upstart Princeton came within a single precious point of usurping top seeded, then-hardwood colossus Georgetown. What I remember most is how the seemingly impossible gradually became possible and then suddenly seemed so probable that I felt as if I was holding my breath the entire second half. Even watching it now, knowing the outcome, I feel tingles, not least because of the crowd, how it collectively gasps at every Princeton make and moans at every Princeton miss, and how you can sense them sensing they might be witnessing history, and which Georgetown’s Alonzo Mourning seems to sense too as he gallantly raises his level of play. That Princeton lost, 50-49, is what made it, in retrospect, mythic. Had Princeton won, the What If? would have never been a question at all, and we would have been deprived the tantalizing possibility of every ensuing NCAA Tournament being the one where the impossible dream might come true. That game is what made me realize March Madness, as it was colloquially called until the NCAA trademarked the term into wretched oblivion, was all about the underdog. The NCAA has tried to write the underdog out of the script, which Princeton’s non-win helped to prevent as has been recalled many times over in the years since, but for all the NCAA’s stodgy regulations nevertheless favoring the CBB oligarchs, the tournament itself has remained refreshingly, gloriously egalitarian. I am liable to forget Final Fours and National Championships, but I will never forget staying up late when I was supposed to be asleep to listen on the radio as the Richmond Spiders became the first 15 seed in NCAA Tournament history to defeat a 2 seed (Syracuse). A couple years later I ditched out on an event at my Lutheran church because, for the love of God, it was the first day of the tournament, and thank God too, because I saw Santa Clara and some scrawny freshman named Steve Nash become the second 15 seed to beat a 2 (Arizona). 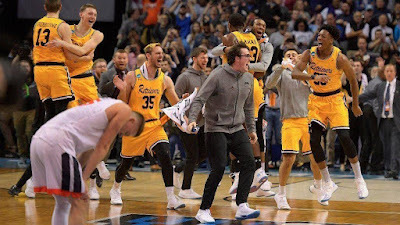 That particular upset equation has happened more frequently over the years while so-called mid-majors like George Mason and Virginia Commonwealth have begun penetrating the deepest reaches of March Madness, and yet, the 16 over 1 remained ever elusive. Maybe next year was a phrase often attached to Tony Bennett, head coach of the Virginia Cavaliers, one of the best in his profession not to reach the Final 4. That he had not was often connected, or so it is routinely said, to his playing system, a brand of slow-tempo offense and suffocating defense that in an era of so-called pace and play comes across antiquated, more Princeton, in fact, than Georgetown. Even so, it only seemed like a matter of time, and their 2017-18 season, in which they finished with a record of 31-2 and ranked #1, suggested it would be, a chance to re-write Virginia basketball history, one that has always ignominiously been attached not to a win but a loss — that is, Chaminade, a Roman Catholic Marianist university in Honolulu, then an NAIA school, legendarily toppling the top-ranked Cavaliers in a tiny Hawaii gymnasium in a game that was not televised in 1982. In a wonderful Sports Illustrated piece commemorating that fabled upset’s 25th Anniversary, Alexander Wolff wrote about Virginia’s star player, 7’4 Ralph Sampson, who was great, a future Hall of Famer, but somehow never great enough, carrying the burden of that defeat for the rest of his life. It was a reminder how a historic victor goes hand-in-hand with a historic loser, and as a native Iowan who had invested far too much of himself in an Iowa State basketball team in 2001 that became the fourth 2 seed to fall prey to a 15 (Hampton) I can speak candidly about how brutal it is to be on the receiving end of a defeat that brings most everyone else exaltation. When the bracket for the 2018 NCAA Tournament was unveiled, it did not go unnoticed that the Pennsylvania Quakers were the first Ivy League team to earn the lowest possible seed since.....Princeton in 1989. That Penn appeared perhaps under-seeded ignited bullish thoughts of their springing the 16 over 1 upset, except that those of us specializing in the cosmic sector of athletics knew straight away that this meant the Quakers were doomed. Indeed, Kansas took Penn’s early shots and won. That seemed to settle the question for this year, and one could be forgiven for already wondering “Maybe next year” when University of Maryland, Baltimore County tipped off against Virginia late Friday night. If at first the wonderfully named Retrievers went toe-to-toe with Tony Bennett’s Cavaliers, entering halftime tied at 21, history felt more like a fun probability than a serious threat. But in the second half, UMBC turned and burned. If NCAA Cinderellas often being made on the backs of buzzer beaters have conditioned us to think these games will be close, the Retrievers re-wrote the fairytale, surging to a 14 point lead in the second half's first four minutes. The upset suddenly felt inevitable even if every person who marveled at UMBC on Twitter was countered by an order not to jinx it, just as my beautiful, perspicacious girlfriend, a Washington D.C. native and so basically a Maryland native too, kept telling me not to jinx it as I espoused a bewildered OMG at every Retriever swish. But, it was over. 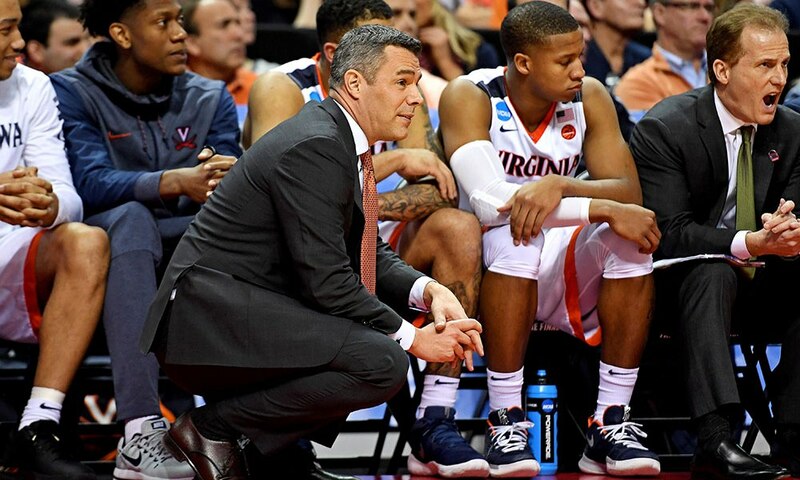 I knew it was over not because UMBC was clearly in the mystical zone, and not just because Virginia’s pace of play is inadvertently designed not to mount comebacks, but because of the look on Tony Bennett’s face. It was one of those little smiles that isn’t really a smile (see below), the kind a character in a noir gets right at the end when the web of his own making has entangled him. Because the game played out this way, it meant that I had time to come to grips with Maryland, Baltimore County becoming the first 16 seed to beat a 1 seed, 74-54, as it happened, and my feelings, despite years of preparation, took me by surprise. When Sir Edmund Hillary and Tenzing Norgay became the first two men to summit Mount Everest in 1953, the highest peak on Earth was one of the last great physical barriers. From there, more people climbed Everest, and then more and more, finally reaching the unfathomable point where people pay absurd prices for guided expeditions to the top and literally wait in line to attain the summit. Something that once was so special is now taken for awful granted. That is not to downplay Maryland, Baltimore County’s achievement or suggest I am not happy for their team and university, and that is not to suggest that in coming NCAA Tournaments #1 seeds will start dropping like flies in the first round. Maybe it will never happen again. Still, As UMBC’s lead grew larger and as the minutes on the clock grew shorter, the more I felt the splendid prominence of that Georgetown/Princeton game shrink. There are so few barriers left anymore in sports and the 16 seed beating the 1 seed was one of the last and most formidable. I felt joy as the barrier was broken, but I also felt sadness, such sadness, such strange, terrible sadness, to see it go.